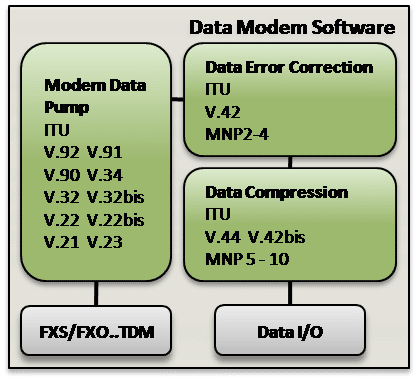 Data protocol software is part of our comprehensive and fully optimized modem software library. The higher protocol layers include V.42 (including MNP2-4), V.42bis, V.44 and MNP-5. PPP framing support is provided as a runtime option. The application interface supports an industry standard AT command set or may be used directly by a user application. The modulation layer provides a HDLC, V.14 or a direct binary framing layer. The line interface may be an analog front end (codec and DAA) or a digital interface such as T1/E1, xDSL, ATM, and ISDN. VOCAL’s data protocol software is optimized for performance on leading DSP and conventional processors from TI, Intel, ADI, AMD and other vendors. Our modem software may be licensed standalone or as a library. Custom designs are also available. Contact us to discuss your modem application requirements. VOCAL’s data protocol software is available for licensing as a standalone algorithm, a library, or part of a complete data modem solution. Custom solutions are available to meet specific application requirements. VOCAL’s embedded software libraries include a complete range of ETSI / ITU / IEEE compliant algorithms, in addition to many other standard and proprietary algorithms. These libraries are modular and can be executed as a single task under a variety of operating systems or standalone with its own microkernel. Additional diagnostic signaling can be selected by the driving application to aid in integration and system troubleshooting.